When an organization introduces a change with a project or initiative, that change needs to be effectively managed on both the technical side and the people side. A technical side focus ensures that the change is developed, designed and delivered effectively. The discipline of project management provides the structure, processes and tools to make this happen. A people side focus ensures that the change is embraced, adopted and utilized by the employees who have to do their jobs differently as a result of the project. The discipline of change management provides the structure, processes and too­­ls to make this happen. Project management and change management both aim to increase the likelihood that projects or initiatives deliver the intended results and outcomes. Although each discipline can function independently, the most effective approach is to integrate change management and project management to create a unified approach to implementing change on both fronts. Here, Prosci provides an overview of integrating change management and project management, including recent data on the effectiveness of integration. When project management and change management are integrated, the efforts of both can be focused toward a singular objective—improving the performance of the organization by successfully implementing a change that delivers the intended results and outcomes. When change management is integrated into the project management steps, the efforts to manage the people side of change can identify and mitigate risks in a more proactive manner, address anticipated obstacles and resistance and build commitment and buy-in for the change. When technical activities and people activities are integrated, the right steps can be taken at the right time in the project lifecycle to help employees embrace the change and produce the right outcomes for the project. Integrating change management and project management activities improves the flow of information. On the front end, the integrated approach helps ensure that impacted employees are receiving the appropriate messages. On the back end, it helps ensure that the project team receives effective feedback on adoption, usage and reaction to the change. Architecting the relationship between the project team and the resource or resources dedicated to change management—integrating at the "who is doing the work" level. In the simplest terms, the change management resources either sit on the project team or sit outside of, but in support of, the team. Sequencing and aligning the technical side activities with people side activities—integrating at the "what work is being done" level. The process dimension has a key role in determining when change management begins during the project lifecycle. Identifying particular tools that can be extended to include both a technical side and people side component—integrating at the "what tools are being used to do the work" level. Risk assessments and communications plans are two common tools that can be effectively integrated. Creating a common set of steps applied by any project that addresses both the technical side and the people side of the change. There is value to an integrated project delivery approach that addresses both the technical and people elements, but hard wiring a "one-size-fits-all" methodology also has potential risks. With the value of integrating change management and project management and the dimensions of integration established, the question remains: what impact does integrating these two disciplines have on meeting a project’s objectives? 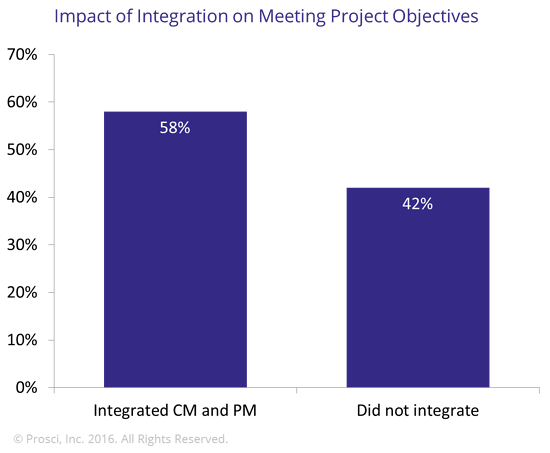 In Prosci’s Best Practices in Change Management-2016 Edition, 58% of the participants who integrated change management and project management in their project met or exceeded their project objectives. The project team must be focused on, responsible for and held accountable for delivering results and outcomes for meaningful integration to occur. If the project team is only held accountable for "flipping the switch" or hitting a go-live date, then integration is difficult. Likewise, change management resources must define their own success in terms of the achievement of project results and outcomes, not simply executing change management activities (such as number of communications delivered or number of employees trained). This shared focus on results and outcomes is the cornerstone of successfully integrating the technical side and the people side of change. Before integration can occur, there needs to be an acknowledgement of the role and value of change management. Change management must be valued and viewed as a crucial component of project delivery. As a change management practitioner, this means making a case for change management that directly connects to the success of the project or initiative. While there are a number of approaches for making this connection, applying change management must be shown to have a direct impact on realizing benefits and achieving the desired results and outcomes. Project management brings a structured process and set of deliverables to the technical side of change. Change management should also bring a structured process and set of deliverables to the people side of change. Without structure and rigor, it is difficult to integrate change management activities into a project delivery approach. Additionally, a structured and rigorous approach to managing the people side of change increases the credibility and accessibility with sponsors, project managers and project teams. Success for a project or initiative results from an effectively designed, developed and delivered solution that is embraced, adopted and utilized by impacted employees. Project management and change management are complementary disciplines with a common objective. When integrated in the delivery of a project or initiative, project management and change management together provide a unified approach for achieving the desired results and outcomes of organizational change. DSV Global Transport and Logistics offers transport services worldwide. 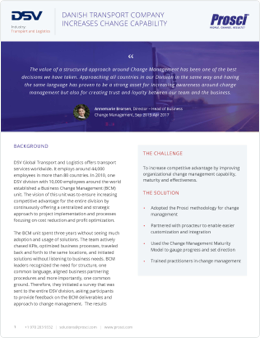 In 2010, one DSV division with 10,000 employees around the world established a Business Change Management unit.